QUESNEL, BC: The Province has approved a new road that will provide an emergency exit route to Highway 16 for residents of the Lhoosk’uz Dene (Kluskus) Nation settlement and people in the surrounding areas. The road will allow for residents living west of the Blackwater River to evacuate to Quesnel or Vanderhoof in the event of an emergency. It will also provide access to Vanderhoof, which will improve options for health care and services. 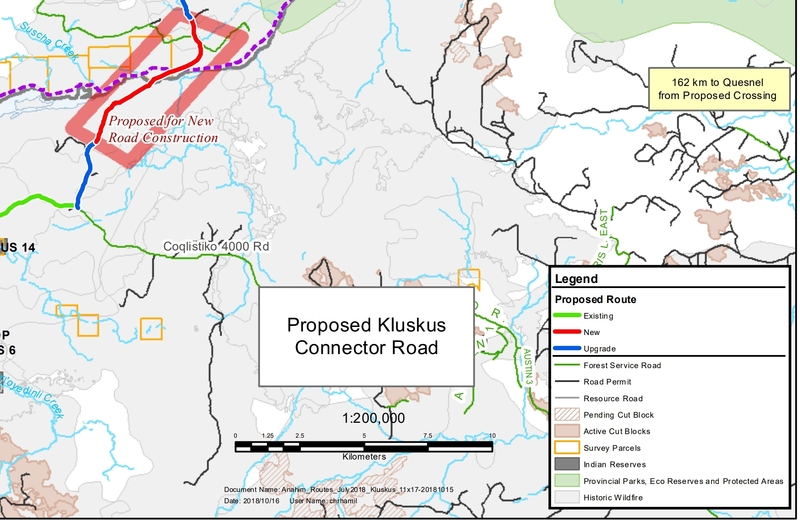 In addition, the road will enable Kluskus Nation to populate and service currently isolated reserves. The project consists of eight kilometres of new construction, including a 40-metre bridge across the Blackwater River and seven kilometres of upgrades to existing roads. Also included are road upgrades and replacement of inadequate, failing or unsafe structures on the current access road (4000 Road). The road will be restricted to non-industrial traffic. The estimated total cost of the project is $3.6 million. Construction is expected to begin in summer 2019 with completion in fall 2020. The decision to proceed with construction was made after extensive consultation with First Nations, stakeholders and the public, as well as completion of environmental, heritage and recreation reviews. Released by the BC Government.